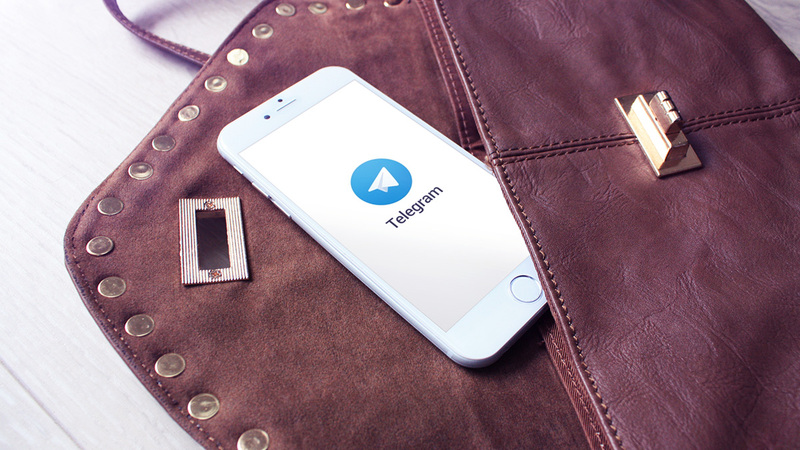 Telegram is one of those secure messaging apps that offer end-to-end encryption to keep your communications away from the eyes of unwanted snoopers. As more and more users turn to the privacy side, competition among security-focused messengers is getting tight. If you’ve decided to leave Telegram because you have one too many of this kind of apps or you’re sticking to an alternative one, deleting your Telegram account seems like a thing to do. If you’ve tried to look for deactivation button within the app and had no luck – you’ve come to the right place. It takes no time to delete a Telegram account when you know what to do, so let us present you with the options and guide you through the steps. Deactivating your Telegram account will delete all your contact lists, messages, groups, channels completely. If you sign up for Telegram later again, any of your messages, channels and contact lists from your older account won’t be restored. 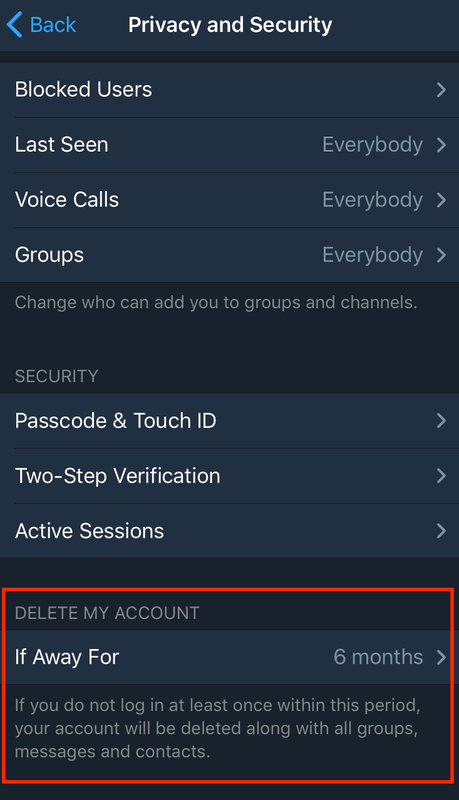 As you might have noticed, there is no option to deactivate your account instantly within the Telegram app. This is because the deactivation process involves both visiting a dedicated webpage and taking action in the app. Another way to delete Telegram takes minimal effort from you but takes longer, as you set your account for delayed auto-destruction. Read on to learn more about both options and choose the one that is better for you. As a part of its security features, Telegram accounts are set for self-destruction after a certain time of inactivity. 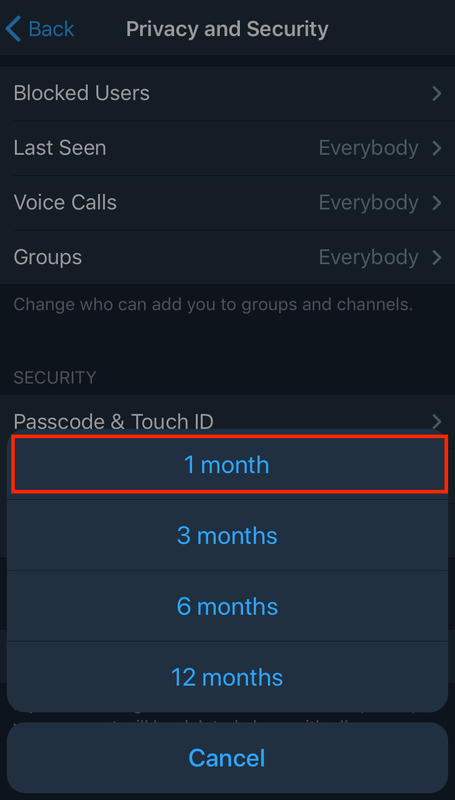 A default period is set to 6 months, meaning that if you don’t log into your Telegram account within that time, it will be deleted and your conversations will be gone forever. You can’t disable the feature, but you can adjust the time after which your account would be deleted, ranging from 1 to 12 months. One of the ways to get rid of your account is set it to self-destruct after a month and then just wait. Of course, you shouldn’t be using Telegram within that time. If you don’t want to wait by leaving your account for auto-deletion, you can take the initiative yourself. 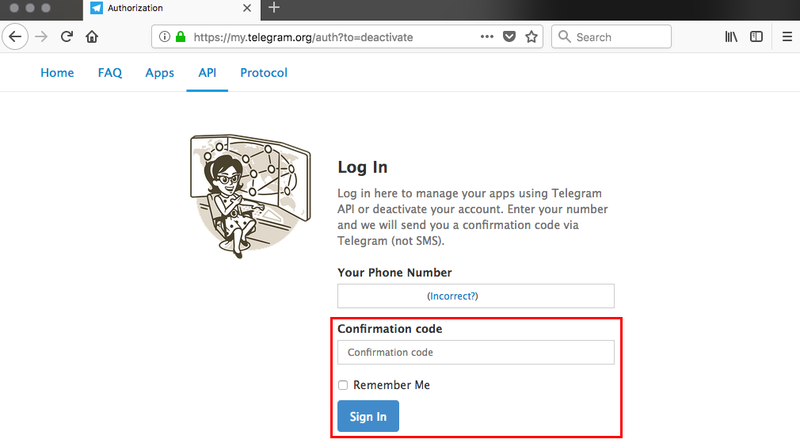 Read on to learn how to deactivate your Telegram account manually. 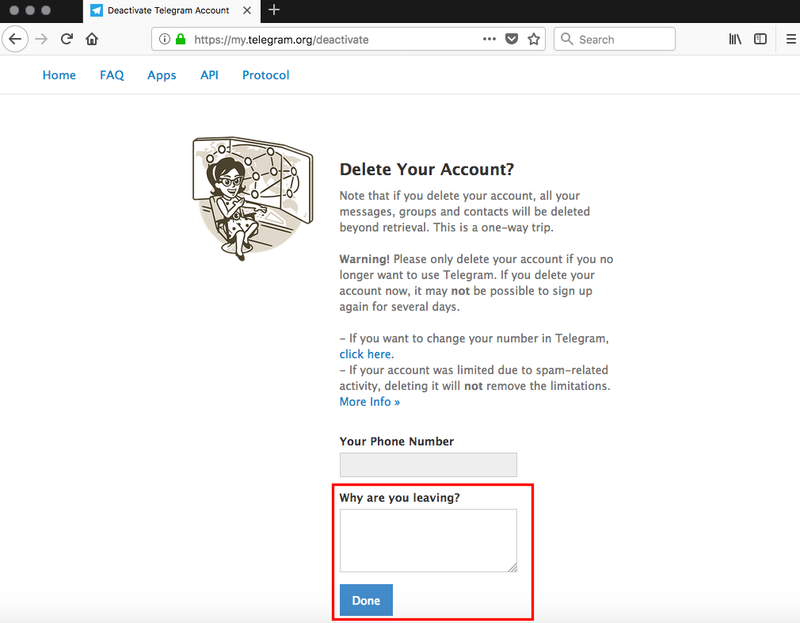 Follow these steps to delete your Telegram account in no time. 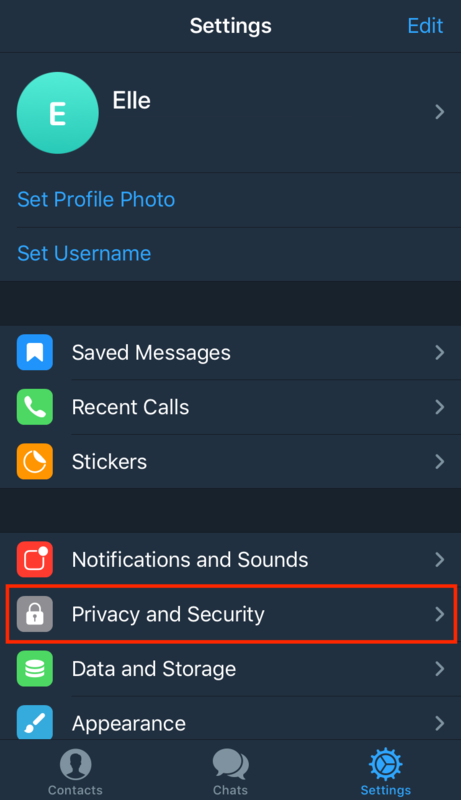 As you might have noticed, there is no option to deactivate account within the Telegram app. Go to the Telegram Deactivation Page on a web browser of your choice. You can use both mobile and desktop browsers – whichever is more convenient for you. Enter a phone number you’ve signed up with to Telegram and click Next. Step 2: enter your phone number. If you have entered your phone number correctly, you will receive a message in your Telegram app (not SMS) with a confirmation code. Now head back to the Deactivation Page opened in your browser, enter the received code to the respective field, and hit the Sign In button. Step 3: enter a confirmation code sent to your Telegram app. Now the page will ask why you want to leave Telegram. Since this field is optional, you can point out your reasons for quitting and give feedback or proceed by leaving the field blank. Whatever you choose to do, click Done afterwards. Step 4: give feedback (optional) and click Done. Now you have to confirm that you haven’t made up your mind and you still want to get rid of your account. If you are sure about your decision, click Yes, delete my account in the popup window. Step 5: confirm your decision. That’s it! Now your Telegram account is deactivated so can no longer use the app.